Not great as a movie (nor as an anthopological work), but man, those pictures nobody will ever be able to shoot again! Ano de Centenário de André Bazin: Repassando os filmes citados em Qu'est-ce que le cinéma? Filme #1 Experiência cinematográfica extraordinária - o que não quer dizer boa. DVDRip no MakingOff. In order to form a cohesive argument about why this film is terrible and should only be seen in an academic light, I would have to give the film far more thought than I'm willing to. Yes, that's a copout. Nope, I don't care. The longer I watched this, the more I detested it. This set the tone of most documentaries that followed. There is staging and editing to fit the filmmakers vision, however the film feels more natural than most film of it's kind. Nanook of the North is a fascinating watch from beginning to end, as Nanook and his family build an igloo, hunt for seals and play in the snow. Doesn't age well beyond a film history stand point of being the first "documentary." I don't mind that much of it was staged beyond making them appear more primitive then they actually were at that point. A few moments are laughably fake but probably not to audiences in 1922. 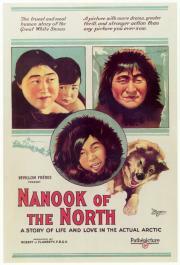 I told my girlfriend I was seeing this film in class and she misread that as "Norm of the North"
Apart from its historical context, I still really enjoyed Nanook of the North. Perhaps I'm an old-fashioned dude, or easily impressed, but I still loved it. Once upon a time, a grammophone was a culture shock. Imagine if we could've given them our memes. An interesting and affectionate demonstration of traditional Inuit ways, that played a huge part in shaping notions of what a documentary could or should be. surprisingly, it was actually kind of interesting ... but still rather boring.